Our school district website uses Events Calendar Pro to display major school district holidays and events, and the WPML plugin to provide equivalent content in Spanish. Overall, the two plugins work very well together. However, there is one problem I have tried and tried to solve on my own, including searching other Help Desk posts, and I can’t seem to find a solution. Does anyone have any ideas why this is failing to translate? I’m using tribe_get_current_month_text(); to display the month name. Good evening Dave and welcome back! This is a bit tricky since you are using a custom view. As you can imagine, pinpointing the cause of the issue might take longer than on the default template. It looks like you are missing the string translation plugin from your install. 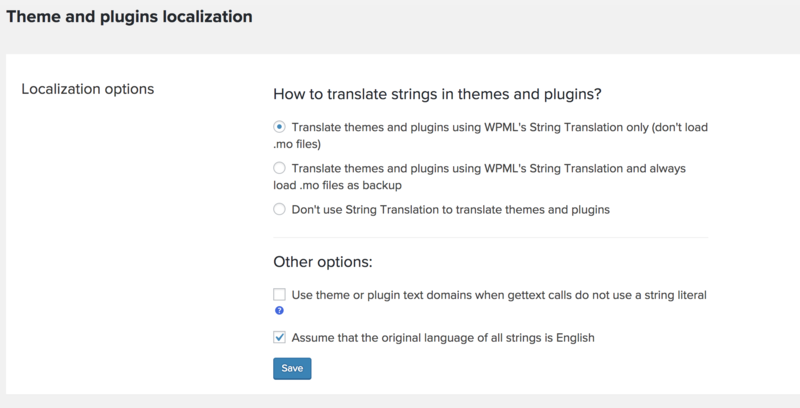 Additionally, can you tell me what your your settings are for the localization option under /wp-admin/admin.php?page=sitepress-multilingual-cms%2Fmenu%2Ftheme-localization.php ? Thanks for your reply! Sorry I’m delayed in replying, busy week. So I’ve cloned our site to a staging server to experiment with this issue without disrupting the live site. On that staging server, I’ve followed the directions on https://theeventscalendar.com/knowledgebase/setting-up-the-events-calendar-with-wpml/ verbatim. I’ve also searched for “January” under String Translation, and all instances already were translated to Enero. But that link is now broken / showing as a 404. As you can see on our live server, the equivalent page URL (https://eusd.org/es/eventos/mes/) works just fine. But over on staging, installing the String Translation plugin seems to be causing it to break. To answer your questions about my settings for Localization Options, please see the attached screenshot. My fear at this point is that this issue is primarily on the WPML side of the line. I frankly don’t have the technical know-how to troubleshoot something this deep, especially seeing how cumbersome and complicated the WPML plugin really is (and their website and documentation isn’t nearly as helpful as The Event Calendar’s). It’s a plugin that works perfectly for standard pages and posts, but I have yet to see it work without issue with another third-party plugin (Gravity Forms, Events Calendar, or otherwise), regardless of what kind of theme is being used. If you have any other hints or ideas based on what I’ve described, and my Localization Options, I’m all ears. Otherwise, I may have to just give up on this and leave the Spanish month view title showing in English because all other aspects seem to be working just fine without the additional String Translation and Translation Management plugins. The topic ‘Month View current month not translating from English’ is closed to new replies.